Storytelling Lumsden is a project that aims to gather, share and map the stories of the residents of Lumsden. The project is now in it third and final stage, and SSW are working with our Artists in Residence to provide a series of workshops based on craft in order to collect some direct stories and record them digitally. These workshops will help to capture the oral tradition of storytelling at the same time as illustrating them through visual arts. This project is a Partnership Project and has been led and supported by Lumden Community Association, Artist Petra Vergunst, who holds a PhD in Rural Development, Lumsden Primary School, the dot.rural Digital Economy Hub at the University of Aberdeen, Scottish Sculpture Workshop and the residents of Lumsden. Please note that these workshops are aimed at working with local people in order to collect stories for the Storytelling Lumsden Project. SSW, Monday 8th February, 2pm-4pm. Gabriela Bandeira is an artist from Rio in Brazil. She is currently studying Arts course at Federal Fluminense University (UFF), in Níteroi city. Gabriela’s work deals with social and cultural engagement, and always uses recycled materials. She also works with photography and film in her practice. For this workshop, Gabriela thought of developing with Lumsden community a ‘Place of Memory’, creating small books where each participant can tell their story. The artist would like each participant to please bring an important image for the book (that can be cut or glued) or a piece of used clothing. These will be used to fabricate the book, but the pieces should also hold meaning for the participant. The memory that objects carry will be shared during the workshop. SSW, Monday 15th February, 2pm-4pm. The workshop will explore some of the meanings and uses of plants in Scotland. We want to hear how plants were used locally and what stories they call to mind. Julia will help you design and make a piece of jewellery with a secret meaning or message (although as it is winter our choice of plants and flowers is restricted). Julia will have some examples of jewellery made from plants to inspire you. We will have tools, findings (catches, wires, threads and clips to finish your piece and) and a selection of plant material. All you need bring is a wish to share your stories and a desire to make your own special organic jewellery piece. SSW, Tuesday 23rd February, 11am -1pm. Beth works with SSW on a freelance basis and has her personal studio based within the workshop. She specialises in hand-built sculptural vessels and has a great knowledge of hand-made glazes. For this workshop Beth will show participants a range of techniques and mark making, in order to illustrate our stories. 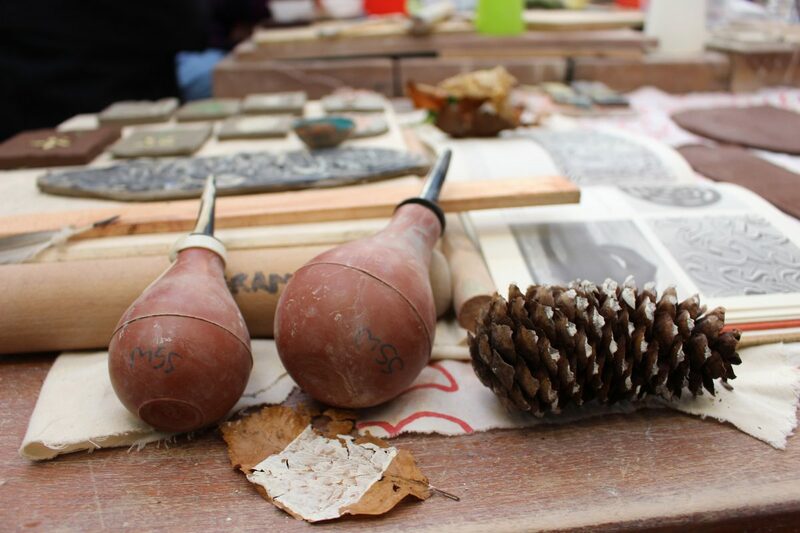 We will be working with ceramic tiles and can work to make individual pieces or a larger collective work which could be exhibited for the Storytelling Lumsden project. Participants will also have the opportunity to learn about glazes and how to apply them.